As I have mentioned in past posts, Ruby was removed from her former home because of severe neglect and is now part of Safe Humane Chicago’s Court Case Dog Program. Court Case Dogs are victims of neglect or abuse who have been rescued by police or animal control officers and are part of criminal court cases against their abusers. In the past, these animals were considered little more than evidence. They lived in a cage with little human interaction until their cases were settled and then were typically euthanized. But thanks to Safe Humane Chicago these dogs (and cats) have a second chance. Staff and volunteers engage, socialize, and train them to be family companions. Once their cases are settled, Safe Humane Chicago transfers them to partner shelters and rescue groups for adoption. 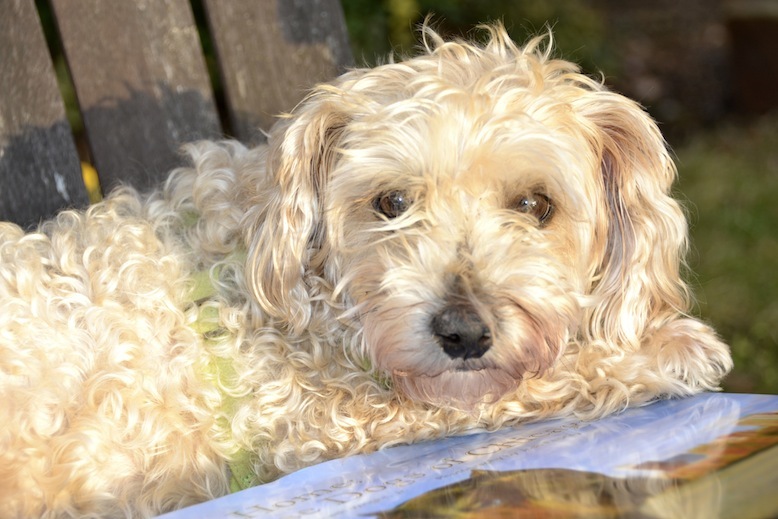 All Court Case Dogs, like Ruby, also receive a lifetime of behavioral support through the program. 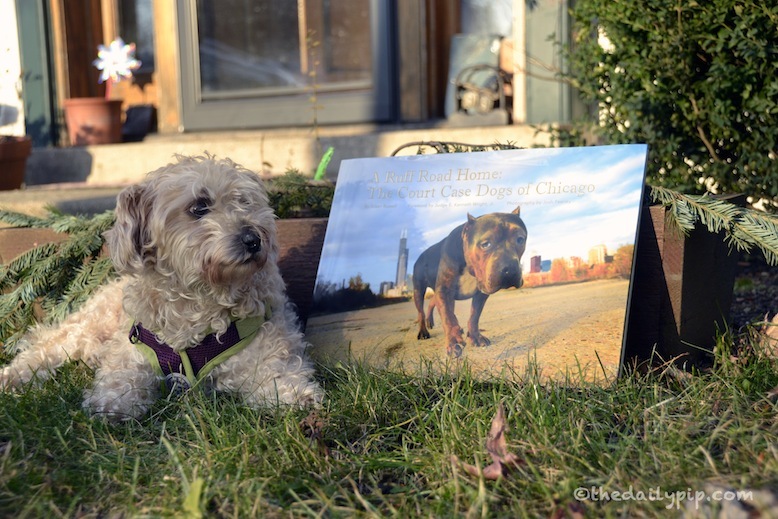 Photographer Josh Feeney and writer Susan Russell have partnered to compile the stories of some of these amazing animals in the new book, A Ruff Road Home: The Court Case Dogs of Chicago. All design, production and printing costs have been donated so 100% of book sales go directly to Safe Humane Chicago to provide support and a second chance to the brave and extraordinary court case dogs. Although Ruby is not included in the collection, these stories of unbelievable courage and survival will touch your heart and change the way you see the world – especially needed in these uncertain and often violent times. Trust me, these stories of kindness and compassion overcoming cruelty and horror will fill you with hope and joy. A Ruff Road Home: The Court Case Dogs of Chicago would make a wonderful holiday gift for any dog lover. You can purchase copies here. However, I have one copy to give away to a lucky reader. This is a heavy book so unfortunately only readers located in North America will be eligible. P.S. : We will announce our Golly Gear winner on Wednesday! Thanks to all who entered. That would be an awesome gift! My heart goes out to each and every one of those dogs. I have to turn my tv off if I hear a story like that on the news…it is so very sad. I am VERY glad that Ruby has found her forever home with you!! What a great program to help those who need it. That sure sounds like a wonderful book. And what a great organization to do all that for the dogs and cats. Ruby, you sure look like you are prospering in your wonderful home. This book sounds amazing beyond words. It is so sad that dogs like your beautiful Ruby have to go through what they do, but then it is so touching to hear the happy ending stories like those that I'm sure are told in this book. I'm so glad you got your happy ending, Ruby, and I pray that all dogs are so lucky! That is such a wonderful program and we're so happy you were a part of it sweet Ruby. What a fangtastic program! Here dogs that are part of abuse or neglect investigations are generally placed in shelters or with rescue groups while they're waiting out their court cases, but it's a very hit or miss program depending on exactly where they are. This is a great idea. We're kind of second chance dogs. My mom was a rescue dog from a high kill shelter and the peeps that rescued her found out that she was expecting. And that's how Owen & I came about. This sounds like a wonderful book. Very powerful.ღ husky hugz ღ frum our pack at Love is being owned by a husky! That sounds like a wonderful program and a wonderful book.We hope it raises loads of money to help even more poor pups.But oh, if only such programs weren't necessary…All the best,Gail and Bertie. What a lovely book. Such a great program! rubytheeze bee for all de pupz N kittehz ~~~~ ♥♥♥♥♥♥♥♥♥♥♥♥♥♥best fishes two everee one on winnin thiz total lee awesum book ! 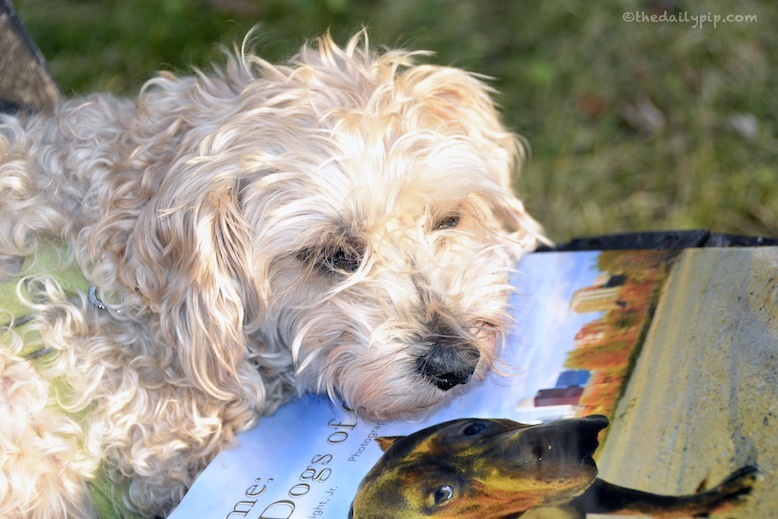 What a pawsome book…and a pawsome program! What a great organization! TW is crying just thinking about the book. Everyone of these pups is a hero and the White Dog Army prays each has found a forever home that loves and cherishes them. Ruby, thank you so much for sharing this information about the program and book with us…weKNOW you hit the jackpot in finding the perfect home and your family is blessed that you joined them…thank you Pip, for celestially arranging that. What a wonderful book and program. We hope that the sales of this book is able to help many pups. I'm sure I would enjoy reading this book for the way the animals rise above the abuse and neglect. This sounds like a lovely book supporting and amazing program. What a great book. I would love to win and read all the stories. I worked at our local humane society for 12 years and often shared my office with cats that were being kept because of court cases. The first cat I had lived in my office for over a year before the case was resolved (he did not go back to his owners). Without the use of my office this poor cat would have spent all that time in a small cage. I understand and appreciate the effort it takes to keep these animals well enough to be able to be adopted when the court cases are over. Ruby has a good home now and is happy. We hope all those other dogs are too. Ruby I am so happy that you are in a loving home now. Mommy loves the idea of the book and the great cause it helps. Ziggy Out!! We were in tears just hearing there was such a book! I didn't know that Ruby had come from such a troubled past. I've been able to see her change with every photo since you adopted her. She is such a lucky dog that you found her. I had no idea! What a tremendous story. Ruby, you hit the jackpot!